Three academic institutions - all with international reputations for excellence - call Midtown Atlanta home. These colleges and universities anchor and fuel Midtown's entrepreneurial economy and are among the key assets that create the hub of innovation here. Enrolling 21,000 students annually across 6 colleges. Offering 36 undergraduate majors, 47 master's programs, 30 doctoral programs, and professional preparatory programs. Ranked #7 by U.S. News and World Report among America’s best public universities, with the undergrad engineering school ranked #5 and graduate engineering school #4. Ranked #25 among world universities by Times Higher Education. A critical economic engine for midtown with annual spending by the institution and its affiliates of approximately $2 billion. 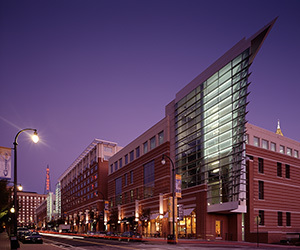 Georgia Tech Research Institute – most often referred to as GTRI - is Georgia Tech’s applied research arm. Last year alone they received $300M in research and collectively, the university took in $736M in grants. Innovation in Action: Georgia Tech’s plans for a High Performance Computer Center for Modeling and Simulation will provide expansive space not only for academic researchers but, as conceived, will offer opportunities for financial modeling by banking and investment companies, high performance data and network applications by computing and communication services firms, genetic modeling by biotech and medical firms, and computational and actuarial modeling by insurance firms. The resulting benefits to midtown could make this one of the most important infrastructure projects in recent memory and transform the future of the city, region and state. The Midtown campus of the Savannah College of Art and Design is home to 1,900 students enrolled in 20 bachelor’s and master’s degree programs. The total SCAD enrollment of 11,000-plus in the U.S., France, Hong Kong, and online, makes it the largest college of art and design in America. Well known for its great success in producing graduates who create careers and companies through art and other creative paths. Among its hallmarks are historic preservation, including the adaptive reuse of Midtown's Ivy Hall and the former WXIA television studio which now houses a Digital Media Center for students to train in a real-world environment. Ranked 6th in the nation among academic medical centers and affiliated hospitals by the University HealthSystem Consortium. The 511-bed hospital employees over 2,500 employees – including 600 Emory medical faculty – along with 800 community physicians, serving 165,000 patients annually. The hospital is also a huge economic driver, generating over a half billion dollars in revenue per year and acting as a magnet for other medical care providers, labs, clinics, specialist offices, and health practitioners to locate in Midtown. Innovation in Action: The Georgia Proton Treatment Center to be located at Emory University Hospital Midtown. According to the Midtown Patch: “Almost six years since the 615 Peachtree building at the intersection of Peachtree Street and North Avenue was imploded, a $225 million, 100,000 square-foot cancer-treating proton facility looks to make south Midtown its home. Co-operated by Emory Healthcare, the Georgia Proton Treatment Center - Georgia’s first proton therapy facility and one of only a handful in the U.S. – will be owned by Nevada-based Advanced Particle Therapy (APT).